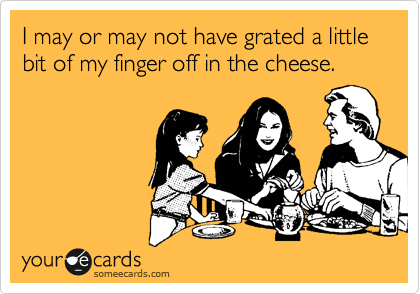 Get It Done Tip: Don't ever buy ready made grated cheese that has additives, fillers, etc. Get a wedge from the cheese section of your grocery store. They will grate it gratis. Ask them to save the rind as you can put that in your spaghetti sauce for extra flavor. You will notice the difference immediately. The grated cheese is fresh and it is all natural. You'll find that because of the bolder flavor you don't even have to use as much. I do this too, but didnt realize they can grate it for you at the store. Good tip!